​One of the best parts of garbhapindasana is that it’s impossible to control the rocking with your mind. Find this flow and you’ll get in touch with your playful inner child. Garbhapindasana has three distinct phases: First, padmasana, or lotus pose. Next, rocking on the spine. Finally, kukutasana. If you aren’t yet practicing padmasana, the modification below will do just fine. If kukutasana is new for you, end garbhapindasana by simply rocking forward onto your hands and shifting your gaze up. Eventually you will lift up onto your palms. 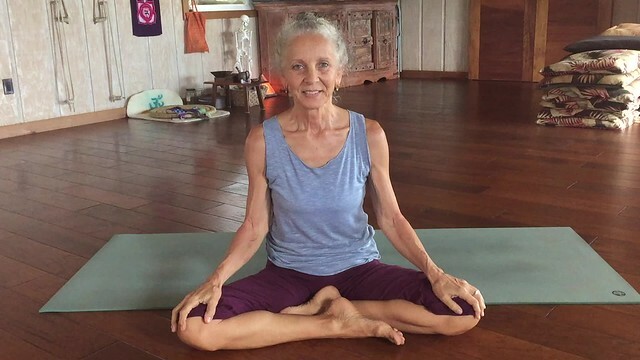 Begin seated on your mat in siddhasana or sukhasana, easy pose. Come into padmasana by lifting your right foot and tucking it into the crease in your left hip. Bring your left lower leg over your right and tuck your foot into the crease of your right hip. Thread your arms through the space behind your knees and place your hands over your ears. Place your fingertips on your forehead just around your third eye here to go within. Lean back, and, using the strength of your pelvic floor, begin to rock back and forth on your spine in a clockwise circle around your mat nine times. When you complete your circle, rock forward and place your palms flat on the floor. Look up and shift your weight into your hands to lift into kukutasana. Hold here for at least five breaths. If you can’t come into full lotus, you can still enjoy the benefits of garbhapindasana with this variation. 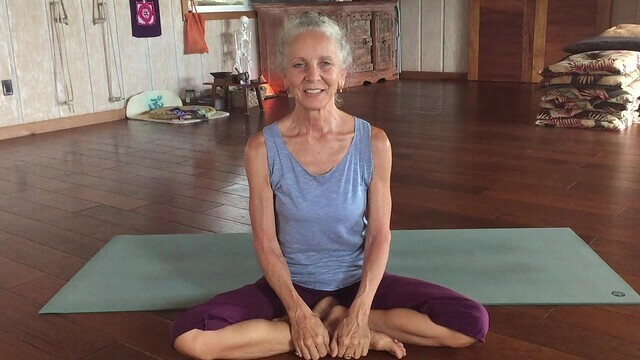 Begin seated on your mat in siddhasana or sukhasana. Pull your thighs toward your chest and wrap your arms around them. Keep your ankles crossed and heels close to your buttocks. Lean back onto your mat and, using the strength of your pelvic floor, begin to rock back and forth on your spine in a clockwise circle around your mat nine times. Use your breath for ease and flow. Rocking too high. Go for a gentle back and forth, just enough to move you around. Bruising the spine. Be sure you have enough padding. Some people will be fine with just a mat, but others might need additional padding. Overthinking the pose. The rocking happens from the breath and the pelvic floor, not the mind.